Cult British group Pink Floyd released its first album in 20 years this month - The Endless River. It entered the Official UK Album Chart at number one. The album is instrumental except the last track Louder Than Words. 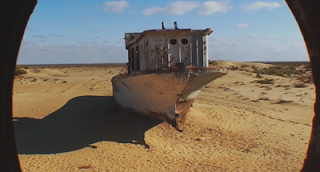 The video clip produced to accompany that song includes footage of the Aral Sea. British production company Hipgnosis, which has worked with Pink Floyd for more than 40 years, filmed in and around Aralsk, Kazakhstan, a former bustling fishing village. Music video director Aubrey Powell was assisted by Kochegary Studio in Kazakhstan. Powell said that the message of the video is that human actions speak louder than words. "It is more important what you do than what you say...The message of the video concerns the Aral Sea. We touched on environmental issues. We shot wonderful, beautiful shots of the sea, ships at a pier. In the video we want to say: "Let's bring back the sea”. That is we hope that it will come back". Powell noted that he was familiar with the problems of the Aral Sea. When he suggested using this theme to the members of Pink Floyd, they supported it. "When we talked with David Gilmour, we decided that the video had to draw attention to these issues, but not only from a negative perspective. We wanted to show that maybe we can help bring back the sea. When bad things happen in our lives, one can find something good in them too. It is not necessary to see everything in a bad light. The message of the video is primarily positive. (...)"
"Like all Pink Floyd songs, this composition is also filled with deep meaning and philosophy, he said. The video will deal with two generations – the young and the old. The ones who have never seen the Aral Sea and the ones who told stories about the Aral Sea to their grandchildren". The main characters in the video are local villagers, young and old, who dream of a revival of the sea. The diversion of water during Soviet times from Central Asia's two great rivers -- the Syr-Darya and Amu-Darya -- into the cotton fields of the region have shrunk the lake to some 10 percent of its original size in less than 100 years. Fishing boats that once plied the Aral Sea are now rusting hulls lying in the desert many kilometers from where the shores of the lake are now. It was that surreal quality of ships stranded in the emptiness of the desert that appealed to Powell; but as he said, he also wanted to bring an environmental message to people". Powell said the video is "not so much about the disaster -- that's been written about endlessly -- but more about a generational thing, more about what it means to the younger generation, the children of the impoverished and disenfranchised communities around the Aral Sea that have lost fishing and culture." 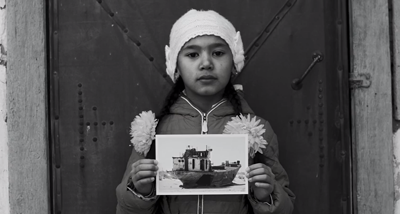 Watch Louder Than Words [4:40 mins] and hope that efforts to restore the Aral Sea may bear fruit. (If the clip does not appear on your device, go directly to: https://www.youtube.com/watch?v=Ezc4HdLGxg4 ).